SharePoint 2013 Search has built-in support for thesaurus enrichment of queries. However, synonyms are often not visible in the search results. This post will show you how you can modify the synonym weight using the Ceres shell. 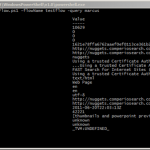 The internal workings of SharePoint 2013 Search can be controlled using the Ceres shell, a set of powershell cmdlets. Using the shell we can inspect and modify a whole lot of stuff that probably never was meant to be touched by end users. Modifying the flow configurations can potentially ruin your SharePoint installation. Comperio Search will take no responsibility for any damage caused by actions taken based on what you read in this blog . The thesaurus is simple, but it works. Or, does it really? 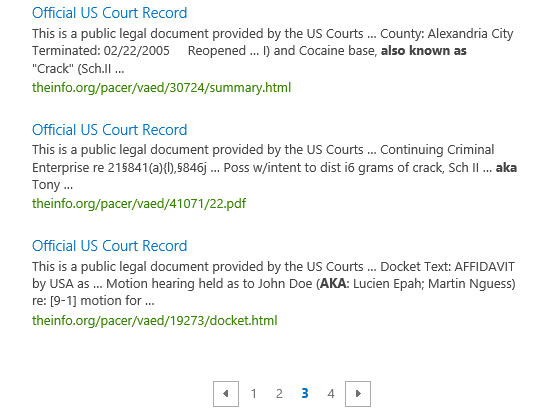 Testing synonyms fetched from the internet on a SharePoint search index populated with US Court records crawled from theinfo.org. AKA is a common legal term synonymous with “also known as”. So let’s try that out. Searching for “aka” yields some hundred results, searching for “also known as” yields a different set of results of roughly the same size. By adding synonyms we would expect the search results to combine the hits for both queries into one, so to speak. I wait for a few seconds, and search for “aka”. Why? Could the ULS logs provide any clues? Turning on verbose logging on the Search Query Processing, and search again. Now, in the ULS logs there are entries with “After thesaurus tree modification” (the indentation is mine, trying to make it look a little clearer, also abbreviated it some). The synonyms are given a weight of 0.2. The original term has a weight of 1, theoretically that means the synonym has 20% percent weight of the original term. Perhaps we could make the synonyms show up by increasing the weight. So, how can we do that? Apparently, there is no way. Not unless we open up the magic box of the Ceres shell. &amp; "C:\Program Files\Microsoft Office Servers\15.0\Search\Scripts\ceresshell.ps1"
Reading the flow configurations for the SharePointSearchProviderFlow, we find an option named synonymWeight. Strangely, it has the weight 0.2. Ring any bells, anyone? It is the same weight we saw in the ULS. Now, let us try to see what happens if we increase the weight here. So, we set the synonymWeight to 1, and upload the file. 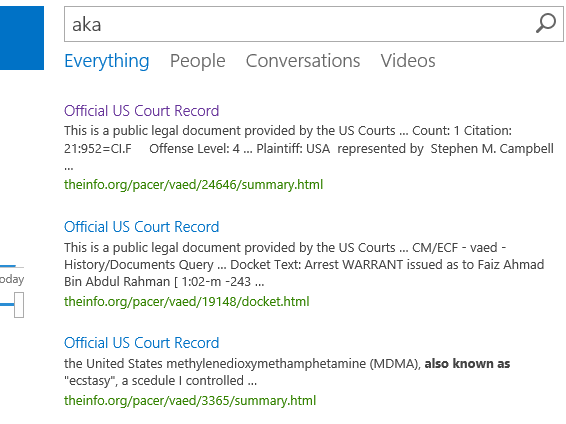 Now, when searching for “aka”, we get hits containing “also know as” on the first search results page. I’m trying to get the synonym into a separate keyword or manager property. How can i get that? Excellent post and exactly what is needed to treat synonyms equally. Have you also modified the stemWeight property? It is the same .2 aka 20% by default. In my testing, stemmed words appeared to behave the same way, plurals were not ranked the equivalent of the root word. I tested modifying stemWeight up to “1″ using the same method. Voila, it appears to behave exactly as expected. I am curious if you’ve done similar tests. On a separate note, I’ve run your powershell in several SP2013 environments without problems. However at one customer (all 3 ENVs) the powershell keeps failing on the Connect-System. Have you run into this? I asked around here, but we didn’t have any good answer on your question, sorry.